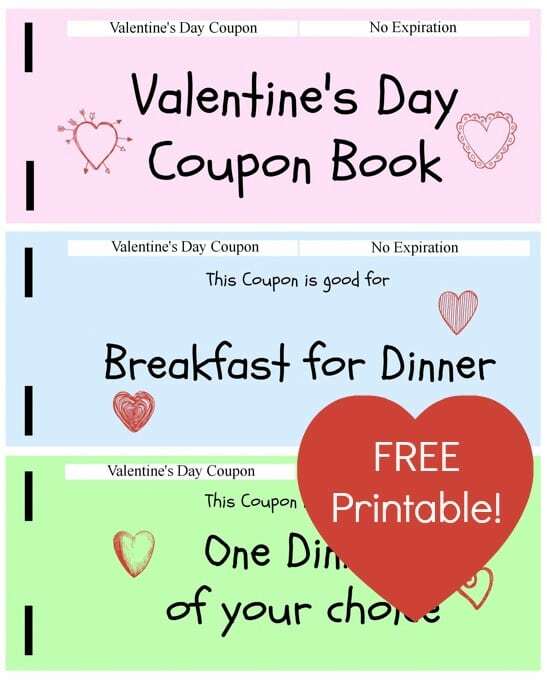 Give your kids a little something special this year with this FREE Printable Valentines Day Coupon Book for Kids. It has five pre-printed coupons for things like Movie Night, Staying Up 30 Minutes Past Bedtime and Dinner of Choice. Then, there are also 3 blank coupons where you can fill in your own selections. What ideas do you have for filling in the blank coupons?? To make your coupon book, just print out the three sheets. Cut the coupons apart, stack them with the cover on top and then staple the left hand side to hold the book together. If you want to get a bit fancy, use a hole punch to punch two holes on the left binding and loop a ribbon through the holes, tying in a bow. Find more Valentine’s Day fun HERE. These are really cool – going to print a couple off- thanks.